Chicago Gay Pride Weekend and Parade : Photos through the years. And a mosaic created out of thousands of PRIDE photos - are you in it? Done scanning through the rainbow pylon mosaic? Now scan through Chicago's legendary Miss Foozie! 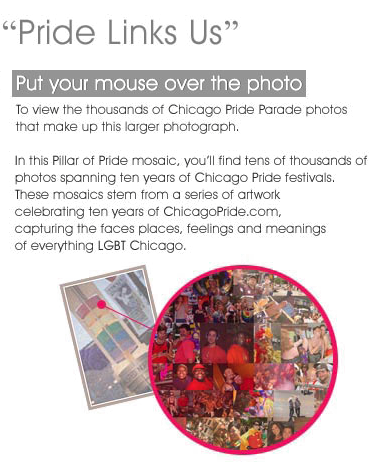 Over the last 10 years, ChicagoPride.com has captured the faces, feelings, places and meanings of LGBT Chicago. Photos from the 2017 Chicago Pride Fest and Pride Parade. Please visit ChicagoPride.com for photos. Photos from the 2016 Chicago Pride Fest and Pride Parade. Photos from the 2015 Chicago Pride Fest and Pride Parade. Photos from the 2014 Chicago Pride Fest and Pride Parade. Photos from the 2013 Chicago Pride Fest and Pride Parade. Photos from the 2012 Chicago Pride Fest and Pride Parade. Photos from the 2011 Chicago Pride Parade. Photos from the 2010 Chicago Pride Parade. Photos from the 2009 Chicago Pride Parade. Photos from the 2008 Chicago Pride Parade. Photos from the 2007 Chicago Pride Parade. Photos from the 2006 Chicago Pride Parade. Photos from the 2005 Chicago Pride Parade. Photos from the 2004 Chicago Pride Parade. 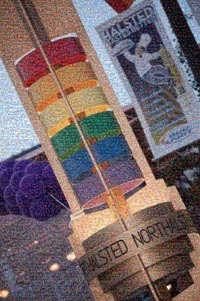 Photos from the 2003 Chicago Pride Parade. View over a quarter million gay and lesbian event photos in the ChicagoPride.com Photo galleries.